When you’ve suffered personal injury, it’s important to take the time and choose the right lawyer for your situation. You’ll be spending quite a lot of time with your attorney and their colleagues at the law office, so you want to make sure you’re comfortable with them. But you also want to make sure that they will focus on your case and make sure that everything is done to get you the best possible results. If you choose the wrong personal injury attorney, you could regret it for the rest of your life. They need to be tenacious enough to get you the money you need to care for your injuries. Here are three indications of a bad personal injury attorney. A bad attorney will let your case languish: If your lawyer doesn’t act quickly on your behalf, evidence and documentation vital to your case can be lost. All of your injuries must be documented before you heal or your files are lost by the hospital. You deserve a lawyer who will give your case the proper attention. Settling for too small an amount: A bad lawyer is one who runs their clients in and out the door quickly, taking early offers from the insurance company instead of fighting to pay for your medical bills. They know the amount they can safely get for the least amount of leg-work, and roll clients over quickly instead of fighting for each client they way they should. Not being willing to take the case to court: Not every case will go to court, and not every case should go to court. 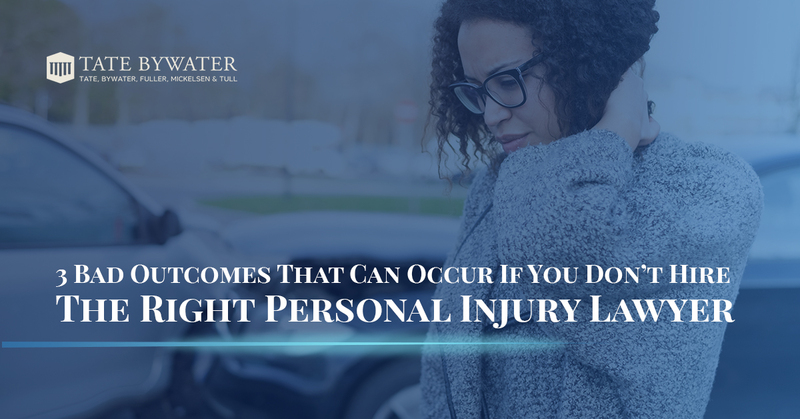 But a good personal injury attorney should be willing to go to court when the situation warrants it, to do the additional work and seek the proper compensation for your medical bills. Don’t trust your future to a bad personal injury lawyer. Give the law office of TATE BYWATER a call when you want someone to give you the full attention you’re due.